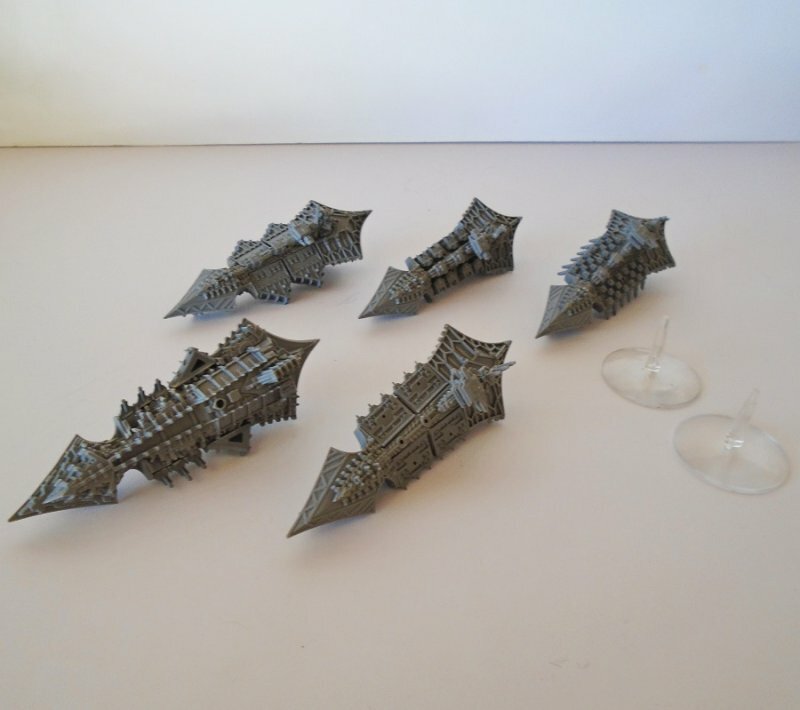 Quantity of 5 spaceship type figurines for use in the game of Warhammer. They are plastic and gray in color. Estate purchase. Offered in this listing are 5 spaceships for the game of Warhammer. There are also 2 stands. They may not be exactly alike, meaning they may not have the same parts added to each one. I don't know what stage of completion they are in as I've never seen or played the game, but two appear to have one of the handle throttles missing. They are plastic and unpainted. Quite a few years ago I purchased a storage unit at an auction and in that unit were several good size boxes of Warhammer figurines and accessories. There had to be several hundred figures. I had no idea what these pieces were or what game they belonged to, so I packed them up and they've been sitting in my garage for eight or nine years now. Then, a couple of weeks ago I was out going to yard sales and a fella was selling about a dozen of them. He finally told me what I have. I've spent hours and hours on google since then trying to determine if they have names and what to call them. If I'm understanding what I read correctly, there are all types of accessories that can be added to the figurines. Buyer to pay $4.60 USPS First Class Mail Package shipping charges. Shipping is from Arizona.